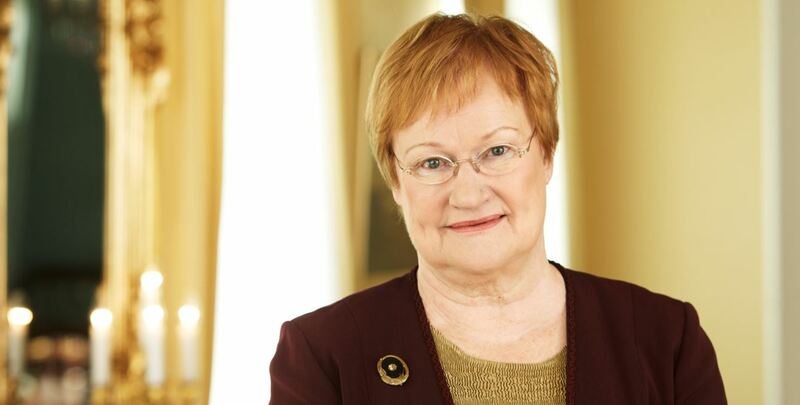 President Tarja Halonen, who served as Head of State of Finland from 2000-12, is to deliver the prestigious Harri Holkeri Lecture at Queen’s on Tuesday 09 May in a presentation entitled ‘Reflections on Women and Peace-building’. Organised by the Senator George J. Mitchell Institute for Global Peace, Security and Justice in partnership with the Finnish Embassy, the event is part of the Institute’s Annual Spring Festival. The lecture will take place in the Council Chamber/Canada Room at the University and will start at 5.30pm. Tickets are free of charge and are available here. Now in its fifth year, the Harri Holkeri Lecture series recognises and celebrates the contribution to the Northern Ireland peace process of the late Finnish Prime Minister, Harri Holkeri. His aspiration to transform conflict and promote social justice in Northern Ireland and across the world, is shared by the Institute. Tarja Halonen was the 11th President of the Republic of Finland; she served two terms in office and was the country’s first female head of state. Renowned for her work and involvement in human rights, democracy and civil society Tarja Halonen worked ceaselessly throughout her career to advance social justice, equality, women’s rights and sustainable development. In a distinguished career she held a succession of ministerial positions: first as Minister of Social Affairs and Health (1987–90) – a position to which she was appointed by Prime Minister Harri Holkeri – and subsequently as Minister for Nordic Cooperation (1989–91) and Minister of Justice (1990-91). In 1995, Tarja Halonen was appointed as Minister for Foreign Affairs, a position which she occupied until 2000 when she succeeded Martti Ahtisaari as President of Finland. The lecture will be followed by a Q&A session facilitated by local journalist and broadcaster, Yvette Shapiro. The Institute’s Spring Festival runs until Thursday 11 May and includes a combination of politics, art, literature, film and documentary in formats ranging from debate and panel discussion to public lecture, conversation and workshops. A full programme can be downloaded here. For further details contact The Senator George J. Mitchell Institute for Global Peace, Security and Justice by telephone: +44 (0)28 9097 3609 or email.